From Russia with Love: A History of Russian Art in Skinner's January Auction | Skinner Inc. Among the most significant and earliest of the artists is Ivan Aivazovsky (1817-1900), the leading figure of Russian Romanticism and master of marine painting and coastal scenes. Aivazovsky excelled at capturing of light, water, and sky, and his paintings garnered the accolades of international audiences throughout his career. The phrase “worthy of Aivazovsky’s brush,” reportedly introduced by Anton Chekov, is still used to describe something of ineffable beauty. Born to an Armenian family in Feodosia on the southern coast of the Crimean Peninsula, Aivazovsky was educated at the Imperial Academy of Arts in St. Petersburg, a path both desired and requisite for aspiring artists of the time. Aivazovksy graduated in 1837, earning a gold medal which enabled him to continue his studies through travel. In Europe, in the early 1840s, he met J.M.W. Turner (1775-1851), whose romantic seascapes influenced the younger artist. 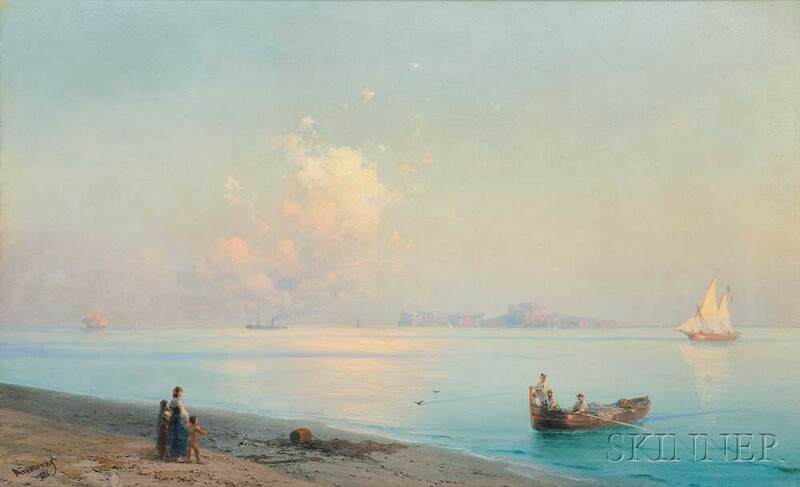 Upon his return to Russia, Aivazovsky received a commission from the Russian Navy as a painter of seascapes, coastal scenes, and naval battles on the Black Sea. A greatly revered artist not only in Russia, Aivazovsky also exhibited throughout Europe, and his paintings were commissioned by the Turkish sultan and families of the court of Constantinople. However, after the Armenian Massacres of 1894-1896, Aivazovsky turned against his Turkish patrons, disavowing all honors he had ever received from them. Over the course of his long career, Aivazowsky created over 6,000 paintings. His favorite subject was the sea in all its moods and effects of light, and it is said that he painted from memory in the studio. He had an impressive ability to recall and recreate the nuances of what he had seen in person, even if only for a short time. The artist returned to Feodosia for his later years, and with funds earned from his successful career, he assisted with the development of the town, opened an art school, began the first archaeological excavations in the region, and built a historical museum. Known for his strong, honest, and joyful paintings of Russian peasants, Philippe Maliavine (Malyavin) (1869-1940) was also trained at the Imperial Academy of Arts, but he did not graduate with a gold medal. In fact, the bold, expressive painting of laughing peasant women he presented for his graduation in 1899 was rejected by the conservative Academy. Instead, he was awarded the mantle of “Artist” based on his works in portraiture developed in the atelier of Alexander Repin. Of humble origin, Maliavine began his study of art by copying icons. His talent was recognized by Vladimir Beklemishev, under whose sponsorship Maliavine entered the Imperial Academy in 1892. Following his formal training, Maliavine worked for a time abroad, where his peasant canvases found favor and were purchased by museums in Paris and Venice. 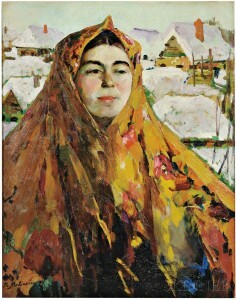 Maliavine’s style has been described as a fusion of Russian Impressionism and traditional folk themes with abstraction. From 1901 through 1910, Maliavine resided in rural Ryazan province where he further developed his large-scale peasant figures, portraying them as strong-willed, independent individuals. In compositions featuring a single person or groups, the artist brought the figures to the foreground and presented them from a low vantage point to increase their monumentality. Using expressive brushwork and a bold palette favoring the color red, Maliavine revealed his subjects’ moods and characters, frequently capturing the figures in motion. These peasants are not always beautiful, but they radiate inner strength and vitality. As his works fell out of favor with Russian critics and the political climate was challenging, Maliavine emigrated to France in 1922, living out his life in Paris and Nice. Another Russian émigré in Paris at this time was Hélène d’Œttingen (1887-1950) who painted under the pseudonym François Angiboult. Stunning and glamorous, Hélène, La Baronne d’Œttingen, flourished in the avant-garde culture in Paris in the early 20th century. She is described as the daughter of a Polish aristocrat, married to a Russian officer, Baron Otto von Oettingen. Assuming male pseudonyms, Hélène wrote novels under the nom de plume of Roch Grey and poetry as Léonard Pieux. She also had a passion for painting, signing her works “Angiboult.” Hélène was both an artist and a catalyst. She organized soirées in Montparnasse which brought together painters and writers of the French and Russian avant-garde, including Apollinaire, Archipenko, Henri Rousseau, Léger, Modigliani, Vlaminck, and Zadkine, many of whom were active at La Ruche, the artist’s building at Passage Dantzig. She is said to have taught Russian to Picasso, and she was painted by both Modigliani and Léopold Survage. Opinionated but also generous, she railed against the Italian Futurists but gave the impoverished Gino Severini his first canvases when he came to Paris and arranged for him to see doctors when he was ill.
Hélène was encouraged as an artist by her mother in her early years in Kiev, learning from books on the Old Masters. She made her way to Paris to pursue her education and became part of the community of artists and writers. 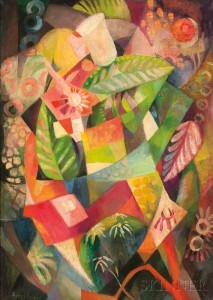 She began by painting traditional floral still lifes and landscapes of Italy, but after criticism from her artistic circle (Serge Férat told her to quit painting), she set out on a more avant-garde path inspired by Cubism, which showed her another way of seeing, a way to break the old rules. Leopold Survage (1879-1968) was for a time her lover and teacher, and Hélène was his patron. She provided him a studio in her home, and they painted together, Hélène absorbing his sense of color and line. In 1920 Hélène’s paintings began to gain attention when she showed at the gallery La Boétie with La Section d’Or, beside her friends Survage, Louis Marcoussis (1878-1941), and Serge Férat (1881-1958). She remained an independent artist whose style was not easily categorized. In an introduction to her painting and design exhibition in 1924 at Galerie Percier, penned by Hélène under the name Roch Grey, she articulated her goal to use the freedom created by Cubism to challenge traditional assumptions and to create a personal style. An illuminating study of Hélène d’Oettingen has been written by Jeanine Warnod, Chez La Baronne d’Œttingen, Paris russe et avant-gardes (1913-1935) (Paris: Editions de Conti, 2008) from which this brief description of her life has been drawn. Learn more about these works of art and other Russian artists during our special lecture by Anna Weinstein, Executive Director of the Boston-based non-profit Ballets Russes Arts Initiative. This entry was posted in Blog and tagged art auction, boston, fine art, François Angiboult, Hélène d'Œttingen, Ivan Aivazovsky, painting, Philippe Maliavine, Phillippe Malyavin, Russia, Russian art, Russian painting, skinner, skinner auctions by Elizabeth Haff. Bookmark the permalink.